Make sure eggs share the plate with other healthy foods, like fruits and vegetables, to provide rounded nutrition. Egg consumption can be part of a heart-healthy diet. Are eggs bad for your heart? For years, men have gotten the message that they should go easy on the eggs-over-easy. But the evidence to date doesn't say you should ban eggs from your plate. In most studies so far, "an egg a day does not have a negative impact on health," says Eric Rimm, professor of epidemiology and nutrition at the Harvard School of Public Health. Instead of worrying about eggs, focus on eating an overall healthy diet and getting regular exercise. An average of one egg a day can be part of that lifestyle. Eggs are a nutritious food. They are relatively low in calories and saturated fat, and rich in protein, vitamins, minerals, and other healthy nutrients like lutein and zeaxanthin, which are good for the eyes, and choline, which is needed by nerves and the brain. The main concern about eating eggs has always been their cholesterol content. The general recommendation is to limit your cholesterol from food to no more than 300 milligrams per day. A single large egg contains more than half of that amount. 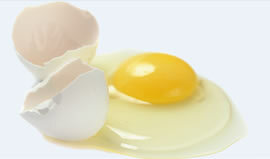 The cholesterol comes from the yolk, so many people choose to eat only the egg white. For otherwise healthy men, this level of concern about egg eating may be unjustified. "Many people perceive eggs as bad because they contain cholesterol," Rimm says. "Yet most of the cholesterol that circulates in our bodies is not from cholesterol in foods, but rather from our liver making cholesterol in response to high intake of saturated and trans fat." Therefore, unless you eat an excessive number of eggs, they will not have a significant effect on your total cholesterol. Limiting your consumption to an average of one egg a day is a reasonable approach. Researchers have also looked for direct links between egg consumption and the chance of heart attack and stroke. In the largest and longest studies to date, people who reported eating an egg a day were not at especially higher risk of heart attack or stroke. However, there is some evidence that if you have heart disease or diabetes, or if you struggle to control high cholesterol, you might limit yourself to three whole eggs a week and eat egg whites otherwise. Rather than fretting over whether particular foods are "good" or "bad" for you, it's best to consider their nutritional value in the context of your entire diet. In moderation, eggs are a healthy food; eaten to excess, they may not be. So although eggs can tweak your cholesterol up a bit, they also contain valuable nutrients that could ultimately help to lower your risk for heart disease. "In fact, if you eat an egg instead of a highly refined piece of white toast or highly processed cold cereal, then the egg will prove to be much more healthful in comparison," Rimm says. Make sure you also pay attention to what shares the plate with your eggs. "Even for my patients with high cholesterol, I don't tell them to avoid eggs," says Dr. Helen Delichatsios, an assistant professor of medicine at Harvard Medical School. "I'm fine with an egg a day on average, as long as it's not accompanied by bacon, hash browns, muffins, and the like." Eggs are not just for breakfast, either. They can be part of many different meals. 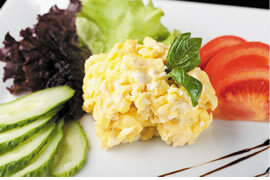 "Eggs are a great vehicle for using up leftovers," Dr. Delichatsios says. "Scrambling some eggs with leftovers plus fresh vegetables, herbs, and spices could work as dinner. It's like a frittata but less work." Source: USDA National Nutrition Database.